To the casual observer, the tissue box looks worn, two out of four corners ripped, one side caved in, another mangled. Some Kleenex executive must have returned from Italy enthused about marbleized paper and decided that a little European flair was just what the product line needed. Some minion then dutifully produced a facsimile in a repeating pattern to decorate the cardboard before it was cut, scored, folded and glued into the shape of a box. The result is the brown box before me. The design of the packaging is not important here. The brown is. 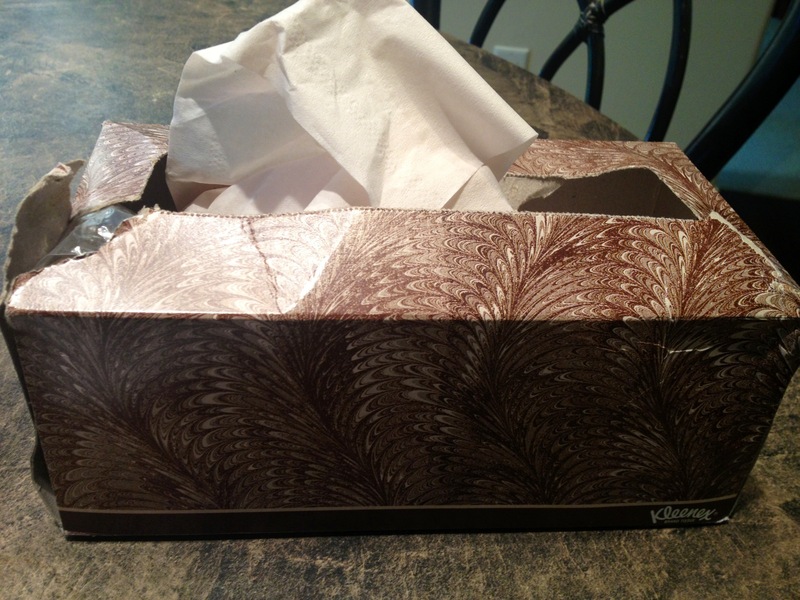 Brown was my father’s favorite color, so I bought brown Kleenex boxes. After dressing and emerging from his room at precisely 8 a.m. each morning (the hour he determined he would be less underfoot), my father pushed his walker to the side of my kitchen table and pressed firmly down on the handles that secured the brakes. He then crab-walked his hands along the edge of the table, moving carefully so as not to fall, and lowered himself into place on the far side. I rose from my chair nearby and surrendered the New York Times, reassembling it for him so that it appeared fresh from the porch. He offered to pour his own coffee, as he did every day. By then I was walking to the coffee maker, as I did every day. It was our little dance of manners; he would offer and I would decline. Coffee with room for milk, doctored with two blue packets of sweetener. It was time for Kleenex. Every morning, while I prepared his coffee, my father prepared Kleenex with the precision of a Marine Corps drill detail. “Snap and pop” they call it. Dad had the snap but had lost the pop. In slow motion, he carefully withdrew one double-ply sheet of Kleenex (he insisted on double-ply) and laid it on the table, aligning it with the table seam that bisected the oval surface. A second sheet was pulled out. He then delicately lowered the second sheet onto the first, taking a moment to make sure the lower corners matched before allowing the top sheet to drift onto its mate. With impressive dexterity, he picked up the entire construction by pinching the top two corners between his index fingers and thumbs, this despite the loss of one top digit to a lawn mower years before. He raised the two double-ply sheets to eye level and inspected them to make sure that the creases lined up exactly. Then he folded the top half over the bottom, and reduced it to pocket size by doubling it again. When he blew his nose (damn post nasal drip, he would say), this improved Kleenex would provide a reassuring eight sturdy layers of absorbency. He supplied his left breast pocket with two such packets, and his left trouser pocket with two more. The prospect of running short on Kleenex was a constant source of anxiety for my father. He not only stocked his pockets, but tucked folded tissues under his bed pillows and stuffed them along the seam of his recliner. Every room that he entered was supplied with a large box. When a box in the bedroom, bathroom or kitchen reached the half-way mark, he asked me to buy more. My husband didn’t realize that, every night, Dad unloaded his pockets into his dresser drawer. Along with his glasses (kept in a plastic sleeve with his Col., USMC Ret., business card taped to the top), my father’s pockets disgorged his hoard: the small vial of nitroglycerin, travel sized dental floss, his wallet. But mostly, his pockets were a storehouse for wads of crumpled up tissue that would cover more than a square foot space with a two-inch high pile. When I saw the brown Kleenex box with the tattered corners shoved in the back of a bathroom cupboard, I recognized it. It’s the last of the supply we laid in for my father. It’s hard to feel moved by tissues. They’re just absorbent paper in tasteless boxes. But this box, this ugly brown box, is a relic of everyday mornings in a sunny chair with coffee, the paper and Dad.